Every week, audiences at the Ashby Stage are treated to an unpredictable adrenaline rush of a theatrical experience. They’re also seeing Shakespeare’s Hamlet. What has Shotgun Players’ done to Shakespeare’s classic to make audiences and actors alike reel with exhilarating nervous energy throughout each performance? In this boldly ambitious production, Shotgun Players presents Hamlet by taking cast and audience members through an edge-of-your-seat storytelling experiment that challenges our assumptions about Shakespeare’s characters and the dynamics between them. In casting Hamlet, Shotgun Players looked for seven daring actors to take on a colossal challenge. With no casting call for brooding young princes, ghostly father figures, or domineering queens, director Mark Jackson and Shotgun Players artistic director Patrick Dooley instead sought to find the ultimate melting pot of versatile performers for their production of Hamlet. These actors, diverse in race, gender, age, and sexual orientation, would sign on to a project that would push personal and professional boundaries. In the casting process, Jackson and Dooley knew that simply being a skilled actor wasn’t enough to survive this cutting-edge Hamlet. In an interview with American Theatre, they say they did “background checks” before casting each actor, ensuring they had not only the acting chops but the “mental toughness” to commit to the production. Every actor had to learn every role. The rehearsal process was intense. “I don’t know if I can do this,” was a real concern for some cast members, to whom being cast in the show meant memorizing the lines and blocking for every character in Shakespeare’s play. The rehearsal process was far from traditional. Rehearsals often took the form of round-robin exercises where actors would take turns rehearsing the monologues, fight choreography, death scenes, and romantic encounters of every different character until 3:00am. When not physically in the rehearsal room, the quest for memorization of Shakespeare’s full script of complex and lyrical verses was nonstop and all-consuming. 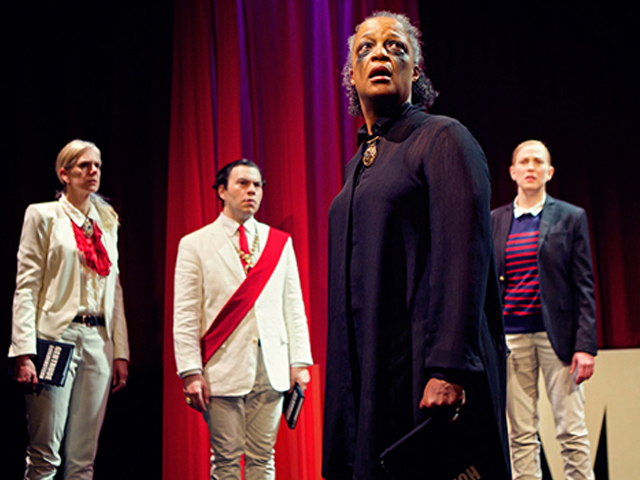 With months of workshopping and and eight weeks of rehearsal, the cast had to live and breathe Hamlet leading up to a high-stakes opening night. Being prepared for a performance means being prepared for literally anything. 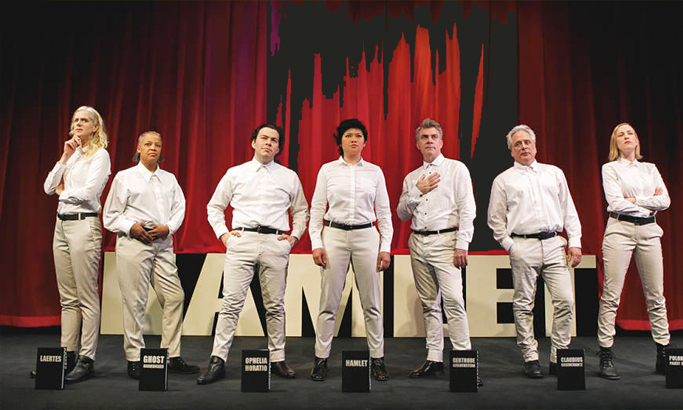 Appearing together in matching white button-downs and khakis, the diverse cast of Hamlet starts each performance with a blank slate for every new audience. One by one, each randomly selects a character from Yorick’s skull (for these purposes, the Shakespearean version of ‘pulling names from a hat,’), and the evening’s roles are revealed and assigned. With just a few minutes to physically and mentally prepare, the actors assemble themselves for the performance and the show begins. With nearly limitless possible character pairings and possibilities, the dynamics change dramatically for each performance. Whether it’s a petite blonde woman playing Hamlet or a 60 year-old man as Ophelia, these out-of-the-box castings aren’t played for laughs. Instead, each actor strives to find authenticity in each character, conveying emotions and relationships that are raw, honest, and real in the moment – all while retaining 2.5 hours of memorised words and staging. Opening night was just the beginning. For most productions, an exhausting rehearsal process pays off on opening night, when actors and creatives can breathe a sigh of relief and reflect on what they’ve accomplished. For Shotgun Players’ Hamlet, the challenge begins again at each performance, and the actors, who now perform on a once-weekly repertory schedule, begin each show with the possibility of playing a role they may not have formally rehearsed for months. The concentration, dedication, and versatility required in the show guarantees that both the audience and performers are kept on their toes each night. 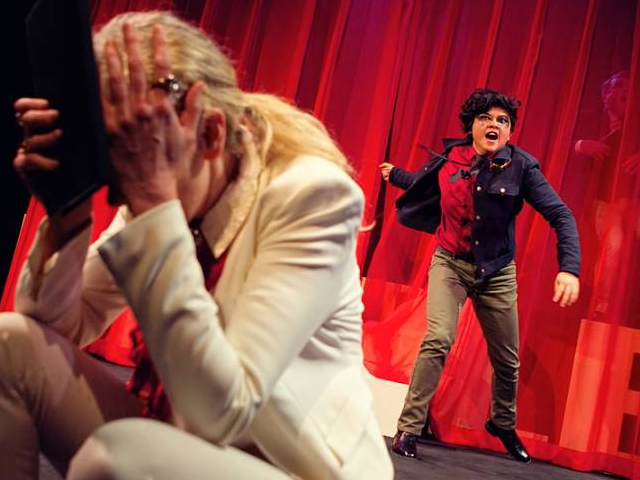 In this rule-breaking production, the state of Denmark is the Shakespearean wild, wild, west – and it’s never been more exciting. Shotgun Players production of Hamlet performs in repertory at the Ashby Stage in Berkeley through December 20, 2016. To enter the mobile lottery for $10 tickets for this week’s performance, tap here.